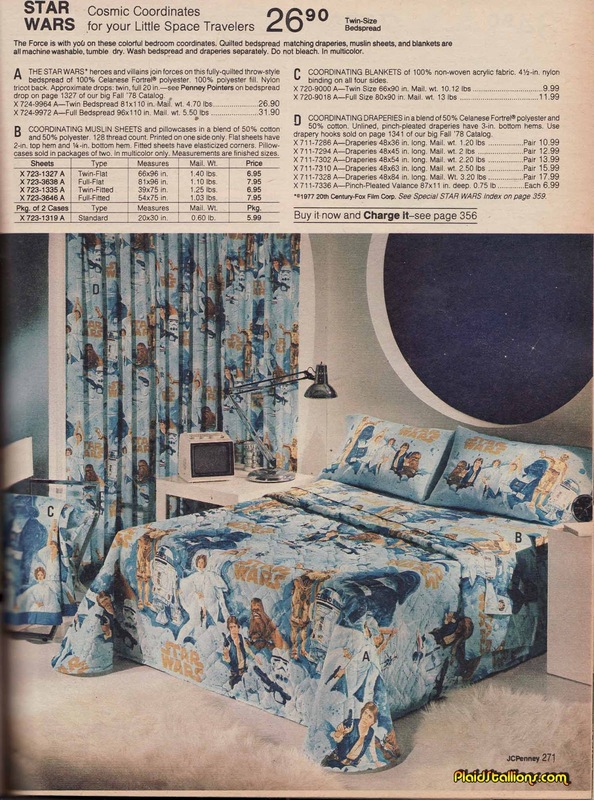 I simply can't look at Star Wars bedspreads and not be happy, it's Pavlovian. Unless said bedspread has Ewoks on it, of course, then I fly into a murderous rage for days shouting "CLEANING WOMAN!" the whole time at the top of my lungs. I should probably speak to somebody about that. It's a gorgeous room and a very weird photo shoot. It looks more like a stylish apartment than a typical wish-book "children's bedroom". Steel director's chair, architect's desk lamp, portable TV. How many kids back in the late 70s had their own personal TV in their bedroom? Particularly ones in the "star wars" age group? No token toys anywhere. Even the curtains are weird. Huge round "space port hole" window over the bed with no curtains and then on the left wall, floor-length curtains covering... what? A sliding glass door to a private balcony or a sun-deck? Then there's the floor. Smooth marble-look linoleum covered with a thick shag throw because... no. This isn't a child's bedroom at all. For all that, it's a lovely image. Still have my original twin-size SW bedding with this pattern. Clean and totally presentable. There was a bath towel with this theme, too.